This week will be a little bit different. 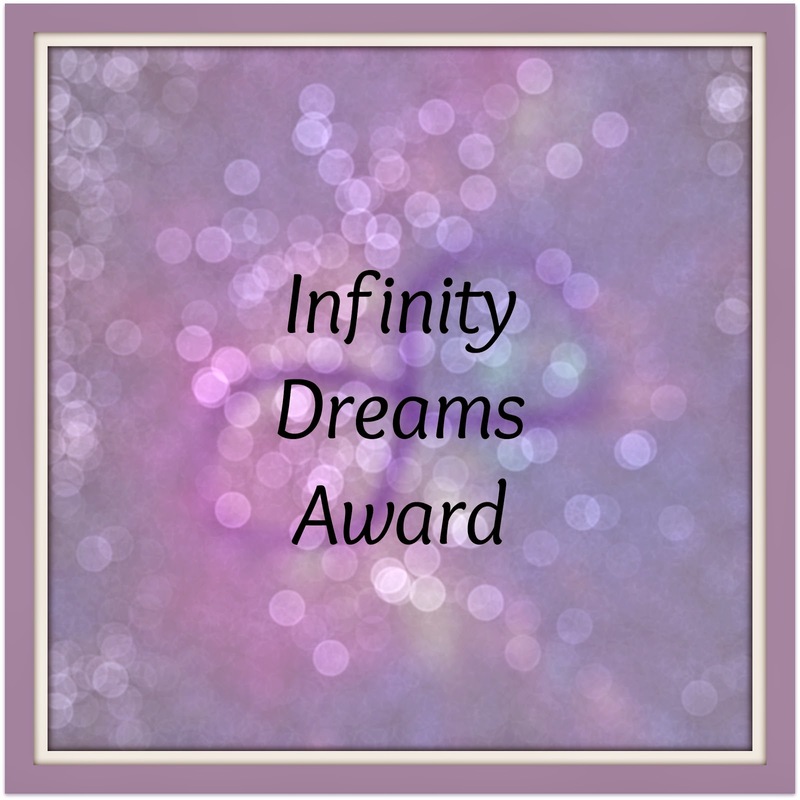 One of my online friends, Tima Maria Lacoba, author of the Dantonville Legacy series Bloodgifted and Bloodpledge, has awarded me the Infinity Dreams Award. Isn’t it purrty? It’s a bit of a Q&A session, so I’ve been placed in the hot seat. It’s been a while since I’ve participated in such blogging awards, but I thought I’d participate so others (that’s you reader) can find out a bit more about me. Of-course I wouldn’t be doing this without Tima, who was generous enough to nominate me, but also ask seven questions instead of the stated eleven. Thanks Tima! 1. If you could have another profession, what would it be? I wanted to be a writer since I was about ten years old, but growing up, I soon realised that wasn’t seen by society (and my mother) as an acceptable career choice. I thought of many job possibilities – teacher, police officer, librarian, teacher’s aid, child care assistant, but found they weren’t ‘me’. By the time I left high school, writing was still in my blood. I went to secretarial college to learn how to type as I knew that would be a huge benefit to my writing. I ended up working in the NSW Police Service, then later within the educational sector,so some of my past career choices sort of came together. I also had a short stint as a child care assistant. So I guess, the long story short is that everything comes back to writing; there is no other profession for me. I’ve heard it said that you don’t choose to be a writer, it chooses you. These days I’m quite content to be in a profession that is still not considered a ‘real job’. 2. Are there any authors who have influenced your writing? If so, who? I began reading Stephen King’s books in high school, so that was a good influence after growing up watching Alfred Hitchcock movies. From there I moved straight onto the classics such as Jane Austen, and the Brontes. Two books that have been the biggest influence to my writing have been Joan Lindsay’s Picnic at Hanging Rock and Anya Seton’s Dragonwyck. Both romantic, yet mysterious and eerie with a hint of the paranormal. 3. Do you have a particular dream? 4. If you could travel back in time, which era would you choose? The 1980s! I’d love to go back to that time, it was great fun. Failing that I’d want to visit the Victorian era. Despite the way women were treated, it would be nice to experience living it all first hand in order to improve my writing regarding the era. 5. What’s your favourite fashion era? This is a tough one, but I’d have to say the 1950s. Simple, elegant, feminine. And because I’ve always loved jukeboxes and the 1950s diners (channeling Happy Days here). 6. If you could have any animal as a pet, which would you choose? Even if it’s mythical. Geckos, they’re pretty cute. Luckily, we do get the odd one around our house during the warmer weather and we all call out to each other whenever we see one. Otherwise I’d love to have a family of meerkats. They’re also really cute and I could watch them all day. 7. List your dream foods. Previous Post When Silence Can be Golden for Writers. Next Post A Month in Blogs – May 2015.